FBI and DOJ officials have conspired to help corrupt officials, law enforcement officers, judges, attorneys and others to conceal an ongoing RICO-like criminal conspiracy to defraud our Judicial System, State / Federal Agencies and taxpayers. On Sept. 3, 2009 FBI agent D. True Brown published a letter containing numerous falsehoods designed to stall any investigation. The FBI has kicked a complaint detailing Brown’s crimes all around the bureau for the past seven years and has ignored over a thousand documents contained in FBI files. 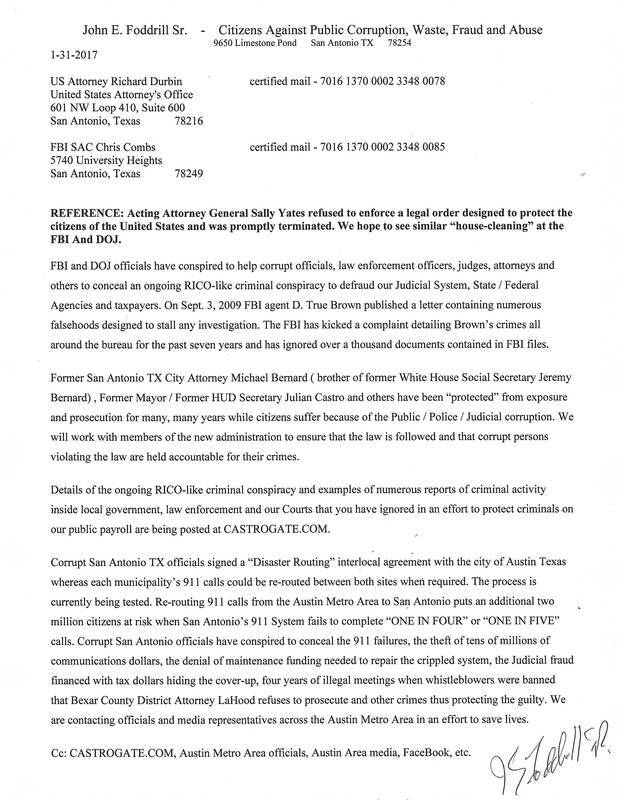 Former San Antonio TX City Attorney Michael Bernard ( brother of Obama White House Social Secretary Jeremy Bernard) , former Mayor / former HUD Secretary Julian Castro and others have been “protected” from exposure and prosecution for many, many years while citizens suffer because of the Public / Police / Judicial corruption. Whistle-blowers will work with members of the new administration to ensure that the law is followed and that corrupt persons violating the law are held accountable for their crimes.